Once again, almost everyone has gotten sucked in by a tired investor slogan that’s dead wrong—and it’s costing them big gains (and income). But that’s good news for contrarians like us, because we can bank some easy profits thanks to this all-too-predictable reflex. That’s especially true now that the Federal Reserve has sent out a blaringly obvious signal that it’s stuck to its rate-hike track, calling the economy “strong” after its latest meeting last week. But let’s not get ahead of ourselves. Before I go further, the shopworn myth I’m talking about is that REITs nosedive when interest rates rise. Many folks just can’t be talked out of it, despite all evidence to the contrary, including the fact that REITs skyrocketed during the last sustained rising-rate cycle, in 2004–06. 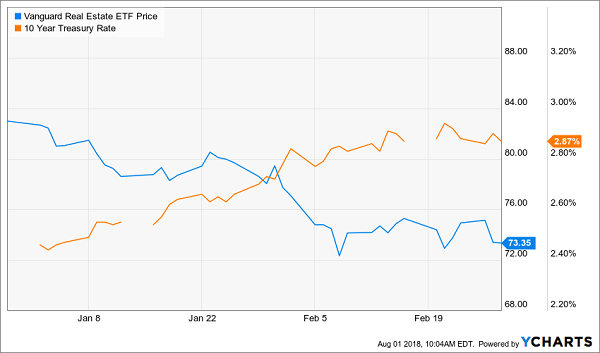 This “wisdom” is deceiving because it looks true: around the time the Fed raises rates or the yield on the benchmark 10-year Treasury takes off, REITs do take a hit. But that’s a very short timeframe—just two months! And folks who dumped perfectly good REITs over the side back then have missed out on a huge rally since. Because after plunging as low as 13% on the year in February, VNQ has surged, mainly on strong REIT earnings as the growing economy powers rent increases and demand for space. The result? 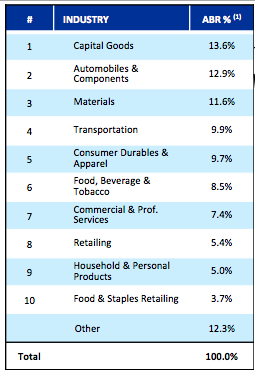 As of this writing, VNQ is underwater by a mere 1.5%! That means just one thing: our time to buy REITs cheap is running out. But if you’ve been on the sidelines this year, don’t worry. Even though REITs aren’t the screaming deal they were six months ago, there are still bargains waiting for us in this rebounding sector. I’ll show you 3 great examples (with dividend yields up to 5.2%) in a moment. First, we need to talk about one popular REIT sector that’s gotten way ahead of itself. Mall landlords are so popular, they’re all most people think of when they hear about REITs—totally forgetting all the other (and often higher-yielding) corners of the sector: everything from cell tower REITs to apartment landlords, self-storage operators and warehouse owners. 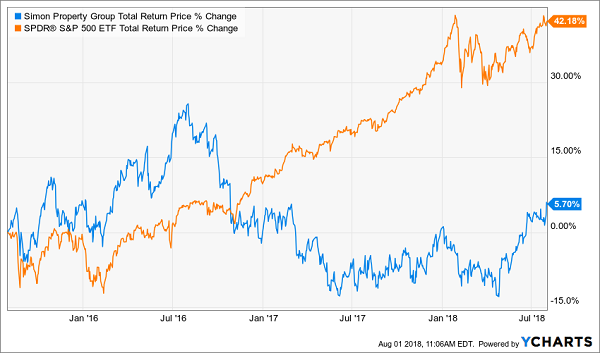 The truth is, retail REITs are fine to trade in and out of … in the short term. But stretch that out over a longer time—say over the last three years—and performance has been dismal: barely a 6% return! You’d have been way better off dropping your cash into the SPDR S&P 500 ETF (NYSEARCA:SPY). That’s true. But much of that growth came before Amazon (NASDAQ:AMZN) was taking a huge bite of mall tenants’ bottom lines, as it is today. And the fact is, while some mall owners are having success re-leasing shuttered locations of Payless Shoe Source, RadioShack, Toys R Us and Bon-Ton Stores—just a few of the major retailers to go bankrupt last year—many still have a long way to go. The numbers tell the tale: US malls are at their lowest occupancy since 2012 (according to CNBC), with 8.6% of their floor space sitting empty. This at a time when consumer spending and GDP are exploding! Alexandria Real Estate Equities (NYSE:ARE) is still available for a lower price than you could snag it for in early January. But that won’t last after the trust’s second-quarter results poured in last week—a greatest-hits list that was the envy of the REIT world. To wit: revenue jumped 19% year over year; adjusted per-share funds from operations (FFO; the best measure of REIT performance) spiked 9%; and management upped its full-year FFO forecast to between $6.57 and $6.63 a share, a big leap from the $6.02 ARE generated in 2017. There’s more to come: unlike the average mall landlord, ARE is enjoying superb occupancy, with 97.1% of its operating properties taken up as of quarter-end. That’s thanks to its focus on the growing life-sciences industry: biotech firms working on the latest breakthrough drugs. Don’t confuse “biotech” with “speculative”: ARE’s clients are some of the biggest in the business, including Novartis AG (NVS), Bristol-Myers Squibb (NYSE:BMY), Sanofi (NYSE:SNY)and the Massachusetts Institute of Technology. The payout is safe, at just 53% of FFO (low for a REIT) and reasonably priced: ARE trades at 19.4 times the midpoint of forecast FFO, cheap for a stock with rock-solid tenants and a surging dividend (which will drag the share price higher as it rises). 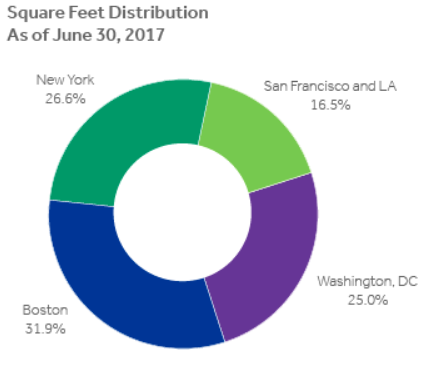 Don’t let the name fool you: Boston Properties (NYSE:BXP) goes way beyond Beantown, with 164 office buildings (48.4 million square feet) in Boston, New York, Los Angeles, San Francisco and Washington, DC. Like Alexandria, BXP boasts top-notch clients, including ultra-steady Verizon (NYSE:VZ): in Q2, BXP leased 440,000 square feet to a subsidiary of the telecom giant and broke ground on its 627,000-square-foot office tower in Boston (50% owned). Verizon will lease 70% of that space for 20 years. Meantime, management is calling for serious FFO growth, with forecast FFO coming in at $6.36 to $6.41 a share in 2018, up from BXP’s previous estimate and way ahead of last year’s tally of $6.22. Like ARE, BXP’s shares are below where they were in January, and they boast a similar valuation: 20.6 times forward FFO—again, reasonable for a REIT with an above-average dividend yield (2.4%) a growing payout (up 23% in the past five years) and a healthy balance sheet (its $10.3 billion of long-term debt is around half its market cap). Plus there’s a hidden benefit no one pays attention to: BXP loves to drop outsized special dividends on shareholders, having done so in three of the past five years. With the “regular” payout accounting for a meager 49% of forecast FFO, another one of these surprise “specials” could come our way any day. Let’s buy now, before that happens. STAG Industrial (NYSE:STAG) gets a lot of space in my Contrarian Outlook articles. 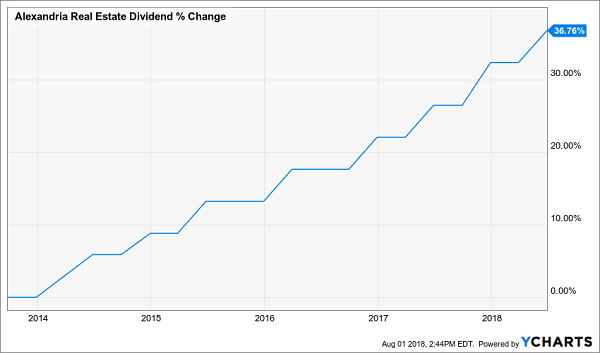 There are several good reasons for that: the warehouse owner pays dividends monthly; offers the highest dividend yield of our 3 picks (5.2%); and delivers strong dividend growth, too (the monthly payout has jumped 18% in the last five years). And second, management is constantly re-evaluating the portfolio, selling properties when it feels their values have peaked and plowing the cash into better opportunities. In just the second quarter, STAG bought 15 buildings for $185 million while unloading five for $31.2 million, making a gain of $6.3 million on those sales. Meantime, the crew at the top does a great job of attracting and retaining tenants, resulting in STAG’s sky-high 96.6% occupancy rate and helping boost FFO by 9.8% year over year in Q2. And yet STAG is still overlooked, trading at the same price it did in January and at a bargain 15.8 times FFO. The dividend is safe, too, at just 81% of FFO. Grab this one and kick-start its fat monthly payout stream now. 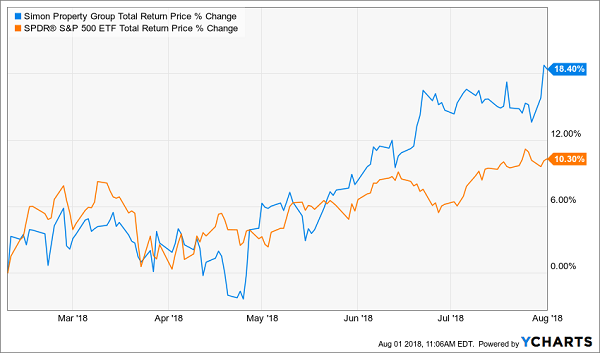 My favorite REIT pick for 2018 boasts a higher dividend than the 3 trusts I just told you about—an eye-popping 7.7% yield—so you’re starting out with a huge CASH gain right off the hop here. This trust lets us play monopoly from the convenience of our brokerage accounts! It’s a well-connected commercial real-estate lender that does all the work for us—building a secure, diversified loan portfolio featuring offices, retail space, hotels and multi-family units. Management then collects the monthly payments, deposits the checks and sends most of the profits our way as dividends! This REIT’s mammoth 7.7% payout is easily covered by FFO, and its loan growth is soaring, setting us up for massive dividend hikes, too! 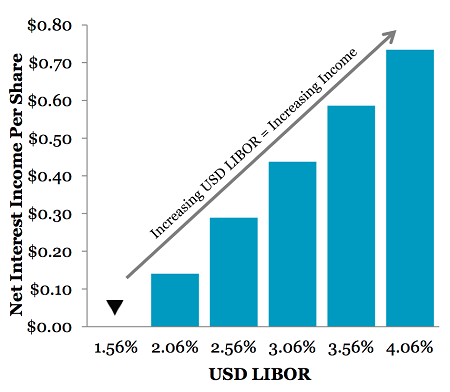 Plus this firm has smartly eliminated interest-rate risk because it uses floating rates. In fact, it’s actually set up to make more money as interest rates move higher! It’s the perfect play as the Fed heads for two more rate hikes this year, and three or more in 2019! And as this REIT’s income—and dividend—march higher, they’ll haul the share price right up along with them. I’m ready to share my full REIT-investing strategy, plus the names of my top REIT pick and another urgent buy with a 7.5% payout, too. 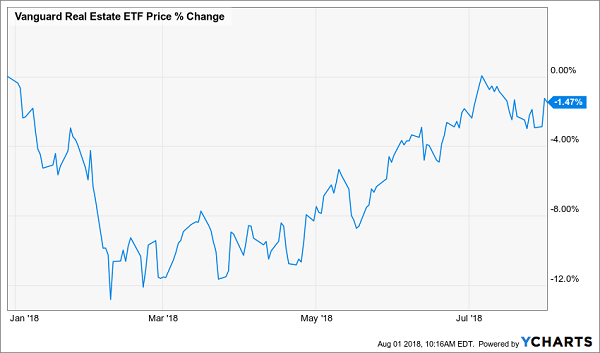 All you have to do is CLICK HERE to get the full story, including the names, tickers and buy-under prices on these 2 incredible 7.5%+ paying REITs now. 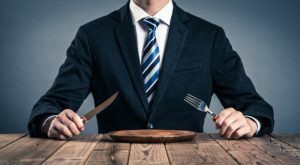 Article printed from InvestorPlace Media, https://investorplace.com/2018/08/3-unloved-high-yielders-rise-rates-pay-7-cash-ggsyn/.